How I became an Artist – and why you should too! Listen to your intuition. Allow your heart to lead. It’s a simple rule to live by and one that not only guarantees happiness, but that you’ll absolutely thrive on all levels. For if you are doing something you love then the saying really is true that ‘you’ll never work a day of your life’. To know inner peace and feel fulfilled is a pretty special feeling. This is how I feel when I create art. I remember as a child regularly visiting my parent’s neighbours back in the UK. Janet became a great friend and would whole heartedly allow and encourage me to use her art materials. I remember being fascinated with her beautiful long and soft paint brushes, rummaging through big crumpled tubes of acrylic paint and wondering how the heck a paper palette was supposed to work?! I sat at her dining table for hours and created art. I am still in awe of the very particular style that Janet has in her work and am proud to have one of her pieces hanging in my home. One particular piece that captured my heart was of a cat’s face in soft pastel on textured colour paper. Each element to this piece excited me. It was beautifully framed and hanging on the wall and it was possibly this that lead me to pick up the soft pastels. I would fill sheet after sheet of coloured sugar paper that I bought in bulk in large sheets. My all time dream was to work for Disney as a character cell animator. I looked into their student programme once and the entry costs were phenomenal but oh what a dream! 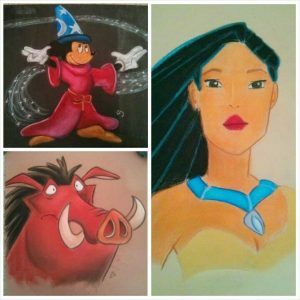 Instead I drew Disney characters in pastel. I found them easy to copy although I could only work large – I would piece sheets of paper together to complete a subject! Tigger (from A. A. Milne’s ‘Winnie the Pooh’) was one of my favourites – I still have the perfect orange pastels I found to create him! As a teenager I opted for Art as one of my High School G.C.S.E. subjects and went on to explore the usual range of medias, techniques, key historical artists and movements. It was still the pastels that were my favourite and I remember struggling terribly with trying to achieve realistic portraits. My confidence wasn’t great at this time as I experienced childhood bullying and I remember thinking that I could only ever aspire to be as good as the others in my class. As I approached College I remember opting for the career path I thought would most serve – in enabling me to live a financially comfortable life through being what I deemed as ‘successful’ and doing what I thought would make my family proud. I went into IT and Accounting – what was I thinking?! Admittedly I very very nearly opted for a Photography A-level although, again, put it in the ‘fun not future’ bracket. It was in my second year at University that I stumbled onto Multimedia – through a simple PowerPoint presentation about Dinosaurs of all things! It involved handling sound clips and some video editing, adding slide transitions and creatively displaying text and I LOVED IT! I went on to try and salvage my degree and gear it as much as I could towards anything creative – this came in the form of web development. After graduating I completed a part-time qualification in Interior Design which was the closest I could find that would give me a wide range of transferable skills whilst being able to study part-time around waitressing work. Upon completion I relocated to Birmingham and got my big break as a Junior Desktop Publisher. It made sense – one of my favourite High School subjects had been IT but because I got to spend hours drawing with Paint and using a DTP package to create endless magazine spreads – I also dreamed of working for a Magazine Publisher for a long, long time. Now I was creating brochures, flyers, graphics, adverts etc. anything and everything for online and print. Without boring you too much with my ridiculously long story, the next 13 years are easy to summarise – I rose not only to become a now qualified Graphic and Web Designer but also to the level of providing Art Directorship and Brand Consultation as well as running my own business. I directly managed a team of 20 in a busy studio that serviced the group companies with five distinctly different sections – the management aspects of this were pretty mind-blowing! It sounds pompous to regally announce my self acclaimed titles although I have always been one to give credit where credit it due – including to myself. I worked hard and deserved to be where I was – and I was bloody good at it! The move to Australia was a life changer – on every level. In the UK I knew that my next step was to Art Director – not only with the salary that went with it but also the working hours! I felt accomplished enough at the level I had achieved and it was time to change track before I made myself sick – I was already seriously ‘burning the candle at both ends’ as the saying goes and it was time to start a family. I’d been working closely with two Holistic Training Colleges (Clear Intentions and Athena School of Complementary Health) for around ten years managing their marketing and web presence. Before leaving the UK I re-trained as a Holistic Therapist. Now this is a key bit – because in doing so I changed as a person. It didn’t take long to realise that my life was improving – on every level – and that through sharing I was also beginning to help others. Through even the tough times, I’ve seen it as an opportunity to learn and grow and my optimism has never wavered. Some thought me brave in emigrating – others an inspiration. I was invited to share my story in ‘Believe! The Gift of Inspiration for Female Entrepreneurs’ – available in paperback and Kindle. To me; I had simply learnt to follow my dreams. Now, I’ve digressed slightly but you’re about to see why. When we arrived in Australia I knew it was important to reach out and make connections with like-minded people. My then 2-year-old daughter was 15 months off starting Kindergarten and I needed to find some way of staying sane as a now stay-at-home mum in a new country. I sat and thought about what I actually wanted to do – a novel idea at the time – and scoured the local community centre newsletters. I joined a local craft group and quickly found myself sat sipping tea with a group of lovely ladies – many my senior but that wasn’t important – and pretending I was crafty. At the time I was dabbling with jewellery making so I’d take along my beads and threads and pretend to be trying to do something. In reality I didn’t quite fit but I got to enjoy two blissful hours of adult me time whilst my girl enjoyed play time with other little ones in the crèche. Alongside this I joined local meditation and spiritual development/support groups one evening per week. I had my support network and it was through this that I came to learn about Mandalas. Through my research of Mandalas I stumbled across Zentangle® art and I simply started drawing. I began sharing my work and building my confidence then one fateful evening at craft group a lady called Jan said to me ‘Well.. we know you’re good at it now what are you going to do with it? !’ Erm. Well. I guess I could maybe take it further. And so I did. I joined an art class, stopped misfitting at craft, framed some pieces and went on to run a permanent market stall at the Adelaide Showgrounds. The rest is history as they say. By this stage I had my pastels back in hand, was trying watercolour painting for the first time and producing Zentangle-Inspired-Art (ZIA) acrylic and inked canvas artworks. Another turning point – someone actually bought my art – then someone else – and someone else! Am I now allowed to call myself an Artist?! Perhaps. Yes! Teaching came about when a spiritual mentor of mine, the lovely Christine Sinclair, who was organising the annual Royal South Australian Society of Arts Summer School, simply contacted me and asked whether I’d like to share Zentangle. After sitting behind the top table in such a prestigious city gallery I guess I really can call myself a Tutor too! Through my Zentangle® and Doodle Art workshops and Colour Magic – Adult Colouring In Workshops I provide a friendly and supportive atmosphere, gently encouraging people to simply try. I’ve met some amazingly talented people and I truly believe that there’s an Artist in each of us. Life will find a way of placing you exactly where you were always meant to be and when opportunities come up you need simply be brave and reach out and take them. Never dismiss your dreams. Never doubt yourself. Always, ALWAYS follow your heart and learn to trust it. Do something you love EVERY day – if everyone did this we would co-habit this beautiful planet very differently. I’d completely dismissed art as a vocation over 20 years ago and yet here I am – about to upload my gallery with a selection of new pieces of which I’m pretty darn proud of! And yet even though I look back over my journey I give thanks and recognition to all the seeming side-steps along the way – EVERY experience has contributed to the person I am today and I wouldn’t be sat here sharing my story if I hadn’t have lived it would I?! I’ve learnt that art is subjective – what one loves another will hate – and that’s ok. Never create for someone else – only you – create what YOU love – and put your soul into it. I absolutely know that I’m doing what I was always meant to right now at this very moment. Who knows where I’ll be in a week, month, year’s time – and who cares. Right now I’m an Artist, Tutor and Holistic Therapist. And I’m happy – which makes me a powerful ripple to others. I will always be grateful for Janet’s continued encouragement to ‘keep painting!’ My original mentor. 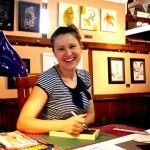 Elizabeth L James is a tutor for the Royal South Australian Society of Arts and runs Zentangle® and Doodle Art workshops and Colour Magic – Adult Colouring In Workshops for small groups and one-to-one around the Adelaide region. 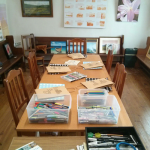 Elizabeth also runs a weekly Kids Art Club at Upper Sturt Primary School during term time. In between that little lot she is mother to Isabella, promotes Holistic Health and Well-being and makes time to create art that she loves. Visit the online gallery to view current original art and fine art prints available to purchase. Posted in Art and Design, Be the Change and tagged A A Milne, Acrylic, Art, Art Directorship, Art Tutor, Artist, Artwork, Birmingham, Brand Consultation, Desktop Publisher, Disney, Drawing, Elizabeth L James, Graphic Design, Ink, Interior Design, Intuition, Mickey Mouse, Own Business, Painting, Pastel, Persistence, Pocahontas, PowerPoint, Pumba, South Australia, The Sorcerer's Apprentice, UK, Web Design, Winnie The Pooh, Zentangle, Zentangle-Inspired-Art, ZIA.